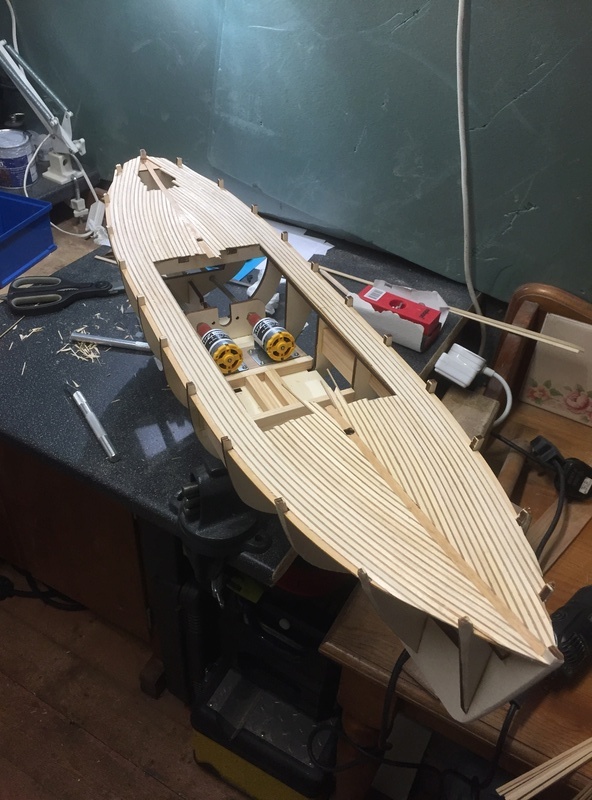 Just a quick post to start the build blog off. On opening the box everything looks present and correct. Really happy with the quality of the timber ( lime and walnut), fittings and plans. As far as planking the deck not sure if I should keep the planks straight for ease or bend to follow the shape of the hull, as the instructions tell you to do. This looks more professional but will be harder to get right. 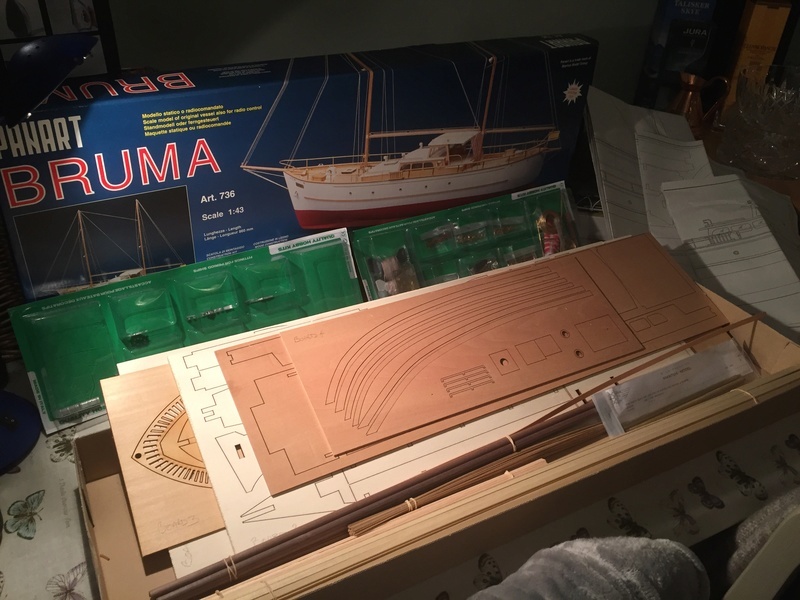 Thought it was about time I got started on this build. 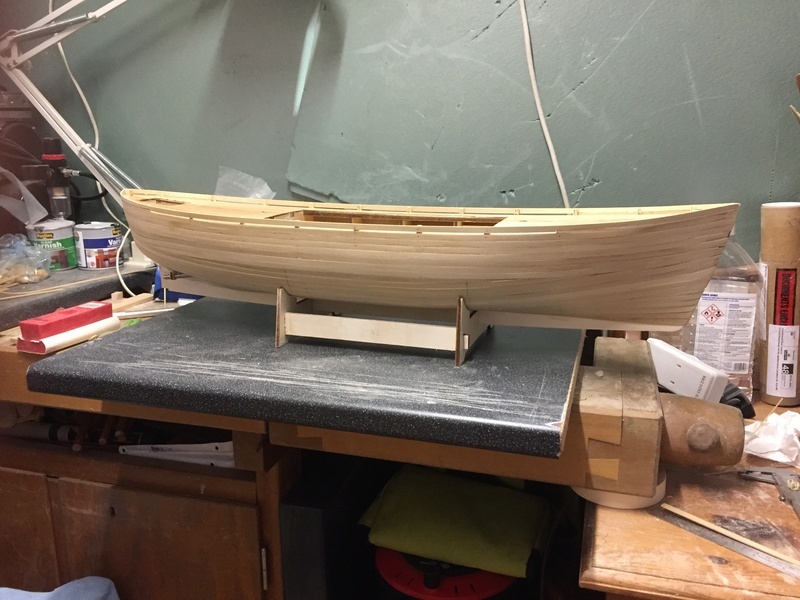 What with work and and other things, boat building has taken a back seat. 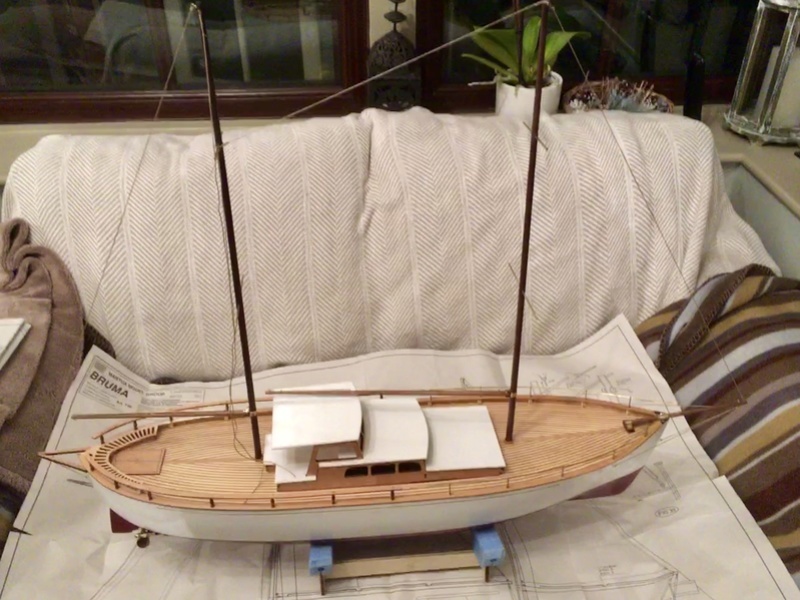 But a trip to the Ellesmere Port boat show last Saturday got me back on track. 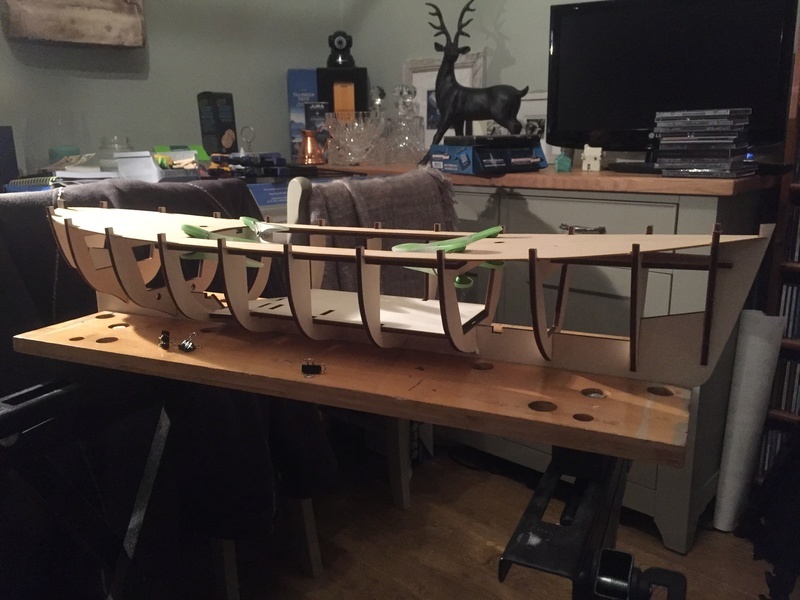 Keel and bulkheads were removed and tried for fit. 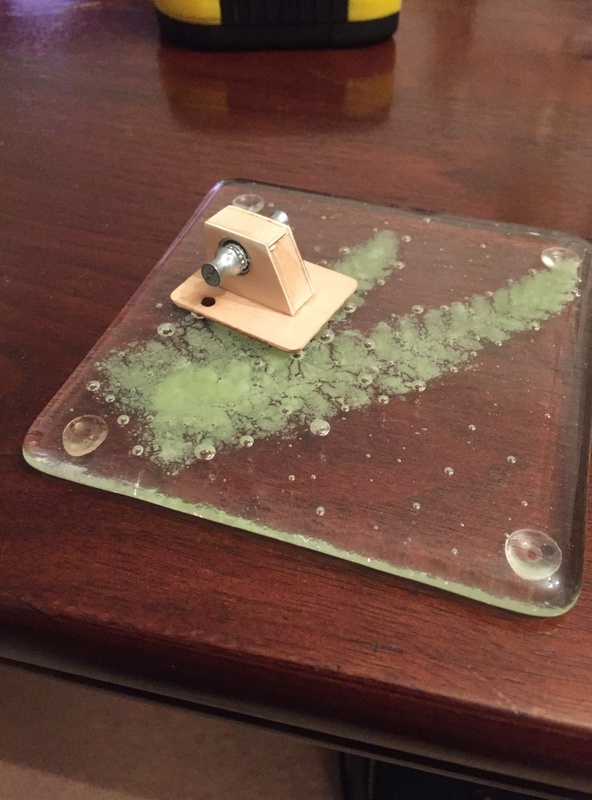 Everything looked ok so everything was glued together with aliphatic glue which I bought at the show as well as a few other things. 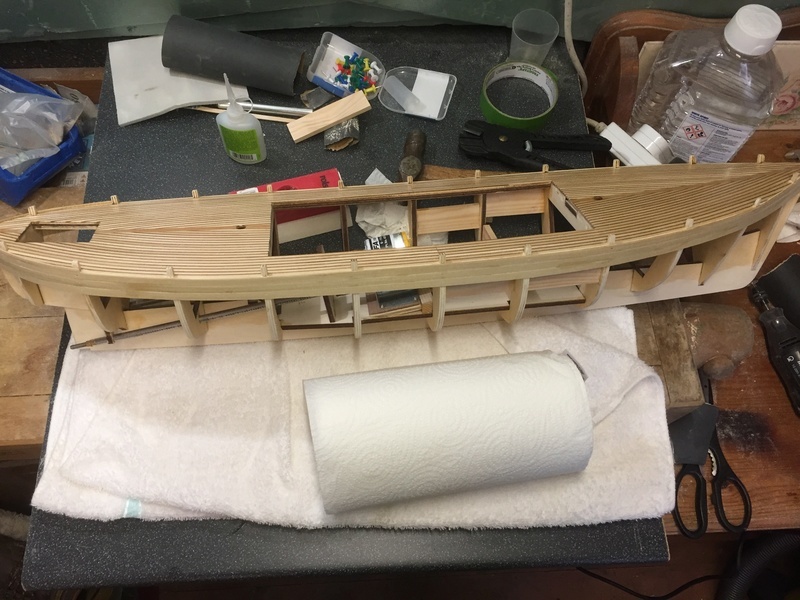 I've loosely fitted the plywood deck to keep everything in the right place while the glue dries overnight. 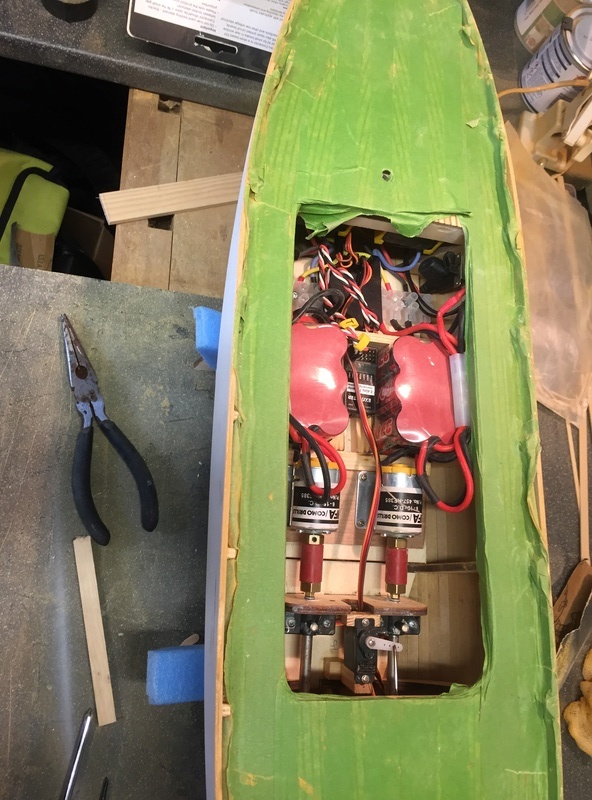 Prop shafts installed. Props in the kit are plastic I've replaced these with brass 35mm 3 blade props. I've also just realised the prop shafts came with plated mild steel locking nuts will have to change these for brass as well. 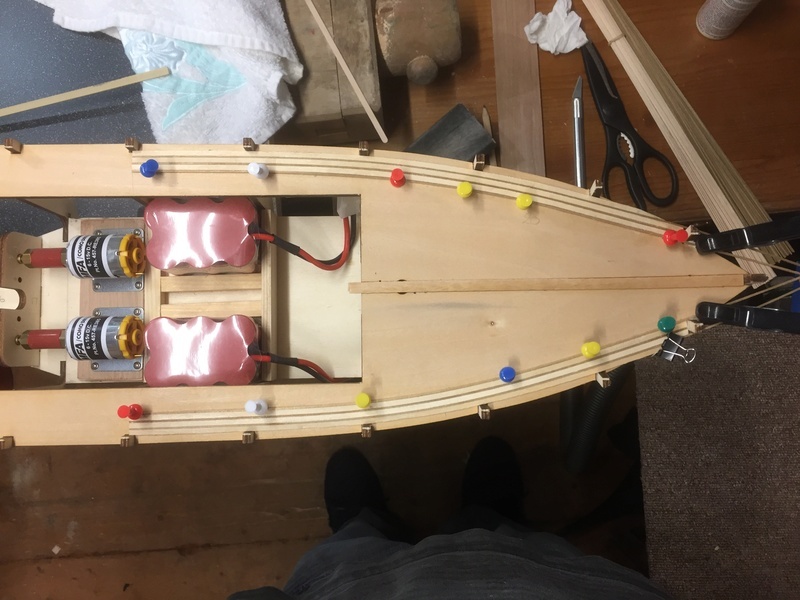 Managed to fit motors and battery packs. 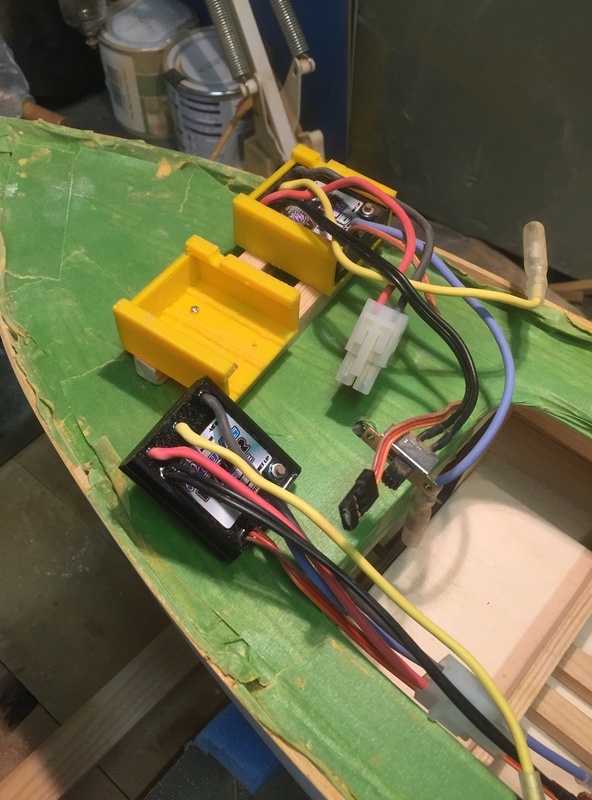 Using two ESC and a action P40D for better control,I hope. 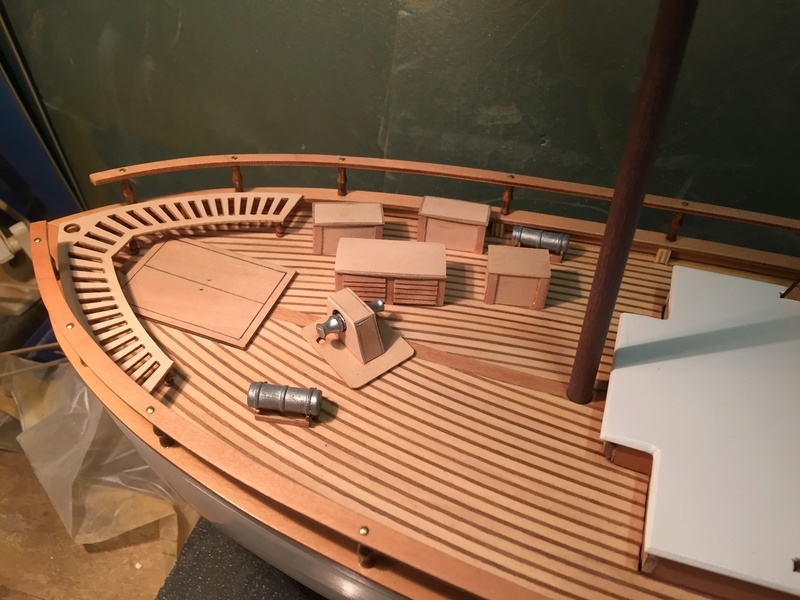 All so started on the planking of the deck,which is going easier than I thought. Great planking job well done. 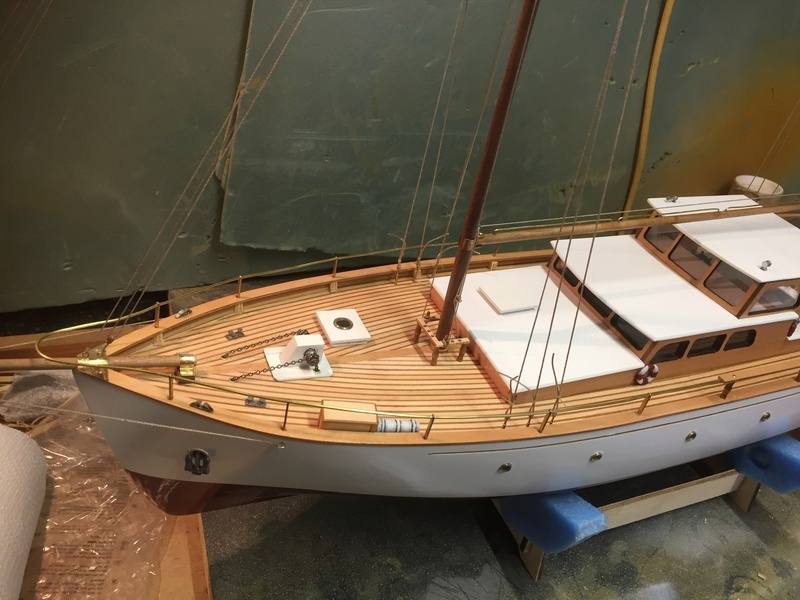 that will look glorious when she has had some lovely varnish on her to give a rich lustre..........am very jealous of such talent and expertise.........and there are some fine modellers building great stuff on this forum..............it is really blossoming into a super, although still quiet site. I am glad to say that there is a lot of skill out there amongst you chaps, and proud to be part of it. Neil it is you and the rest of this group that I class as the masters in this world of boat building. 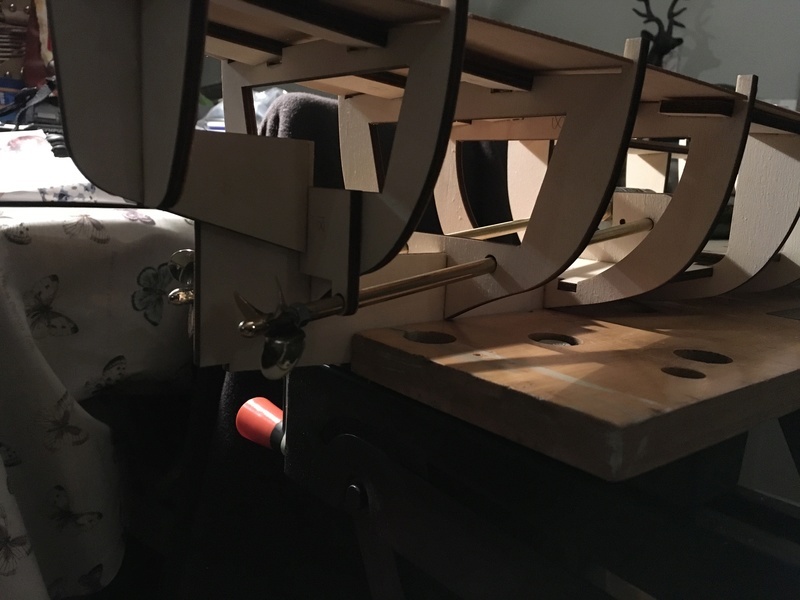 I'm but a novice learning this craft, from you and others through this forum. With posts like these I must be on the right path. Moving along steady but sure. The deck has had two coats of thinned satin varnish, I might change this to matt in the end it's a bit shiny. 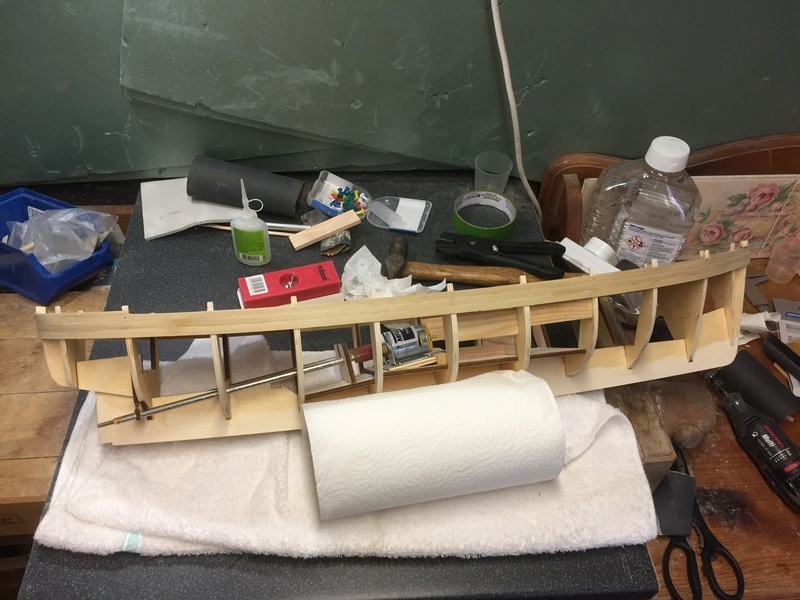 Also my first attempt at planking the hull. 3 planks on each side have gone down. I've come too a point where I need some help. 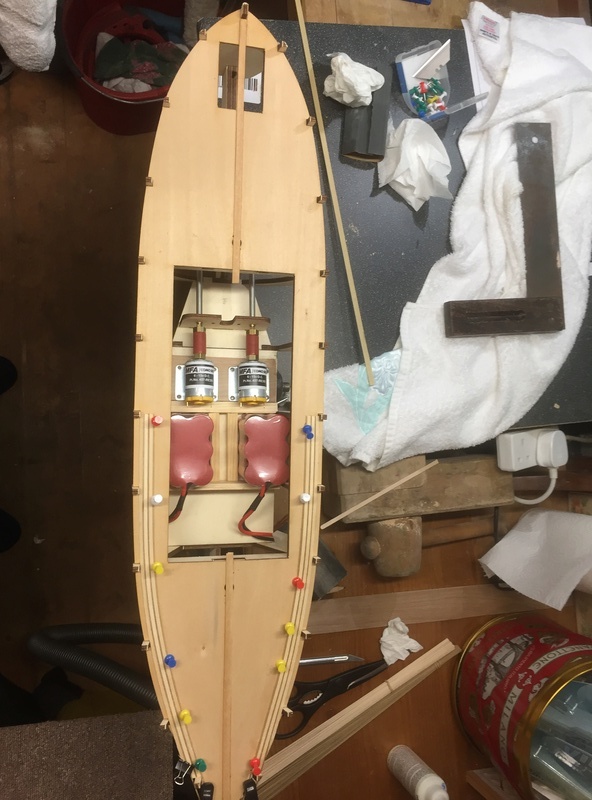 I've got to a point in the hull and realised that there is 3 compartments in the hull that are in closed and I will not be able to seal from the inside. The instructions tell me to lay down 2 layers of planks which are 1.5 mm thick each. Can I just use one layer of planks. Fibreglass and use filler to smooth things up on the outside and then resin areas inside that I have access to. If you think this is a good idea? what materials should I use. i.e. fibreglass thickness, resin, filler. 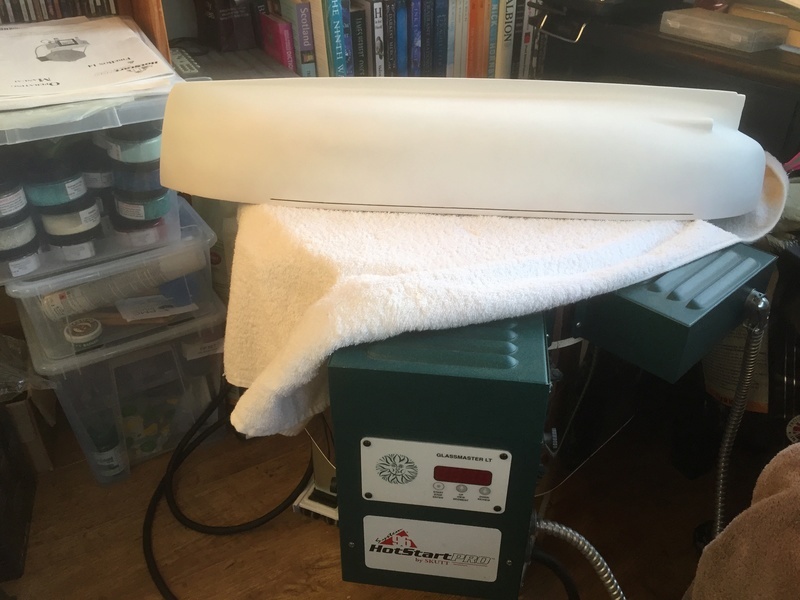 Should I use multiple layers of fibreglass? Ian, I'd be inclined to plank them seal the outside then drill a hole in each sealed section to fit the end o a syringe without a needle, mix some resin, if using polyester resin slightly thinned with styrene thinners don't know the thinners for epoxy resin. 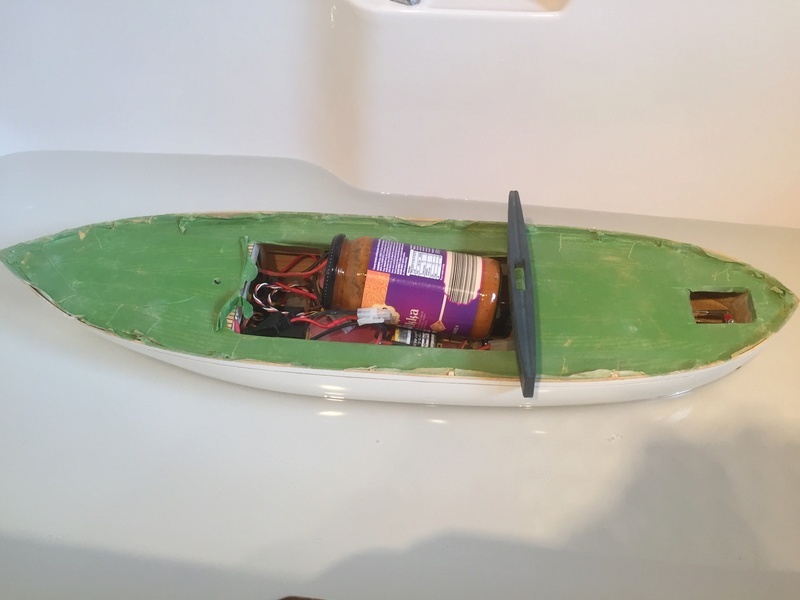 Squirt a syringe full in first section, cover hole with tape then roll hull every which way to fully coat the inside, then remove the tape and hold the hull so the excess can drain out leave to dry then do the next one next day or whenever. Then fill holes with a little body filler. That should aid bonding for the top layer and i'd suggest overlapping the planks ie. edge of new plank in centre of previous plank for maximum strength. 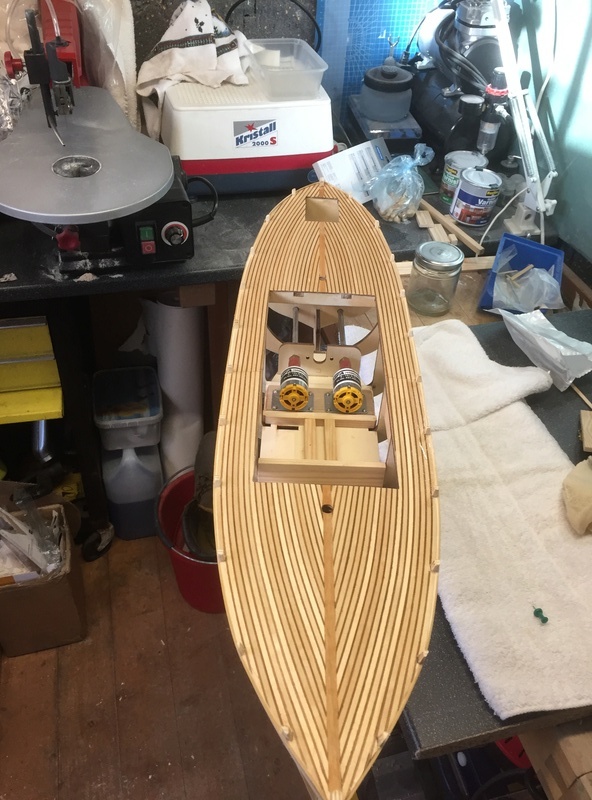 First layer of planks down. Coat of glue next. Then its time to start all over again. Well they say you can't rush a good thing. 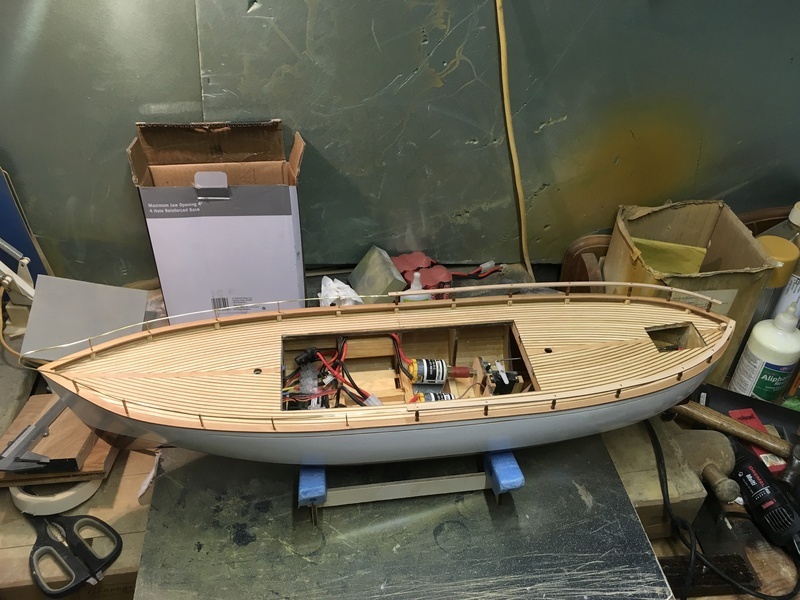 Looking good - its a nice hull shape. 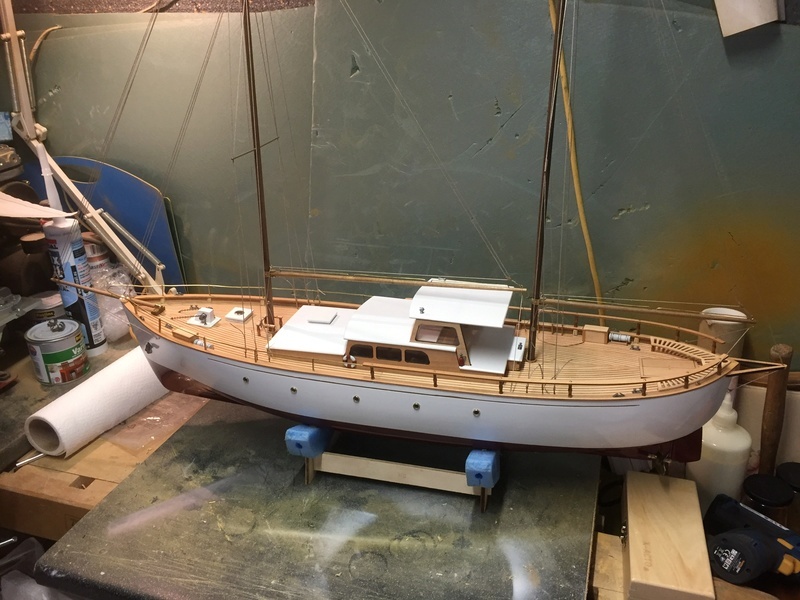 lovely planking......something I have never been able to do without a lot of filler to cover my mistakes...............I blame Billing models crap mahogany snap anywhere planks of their early models. 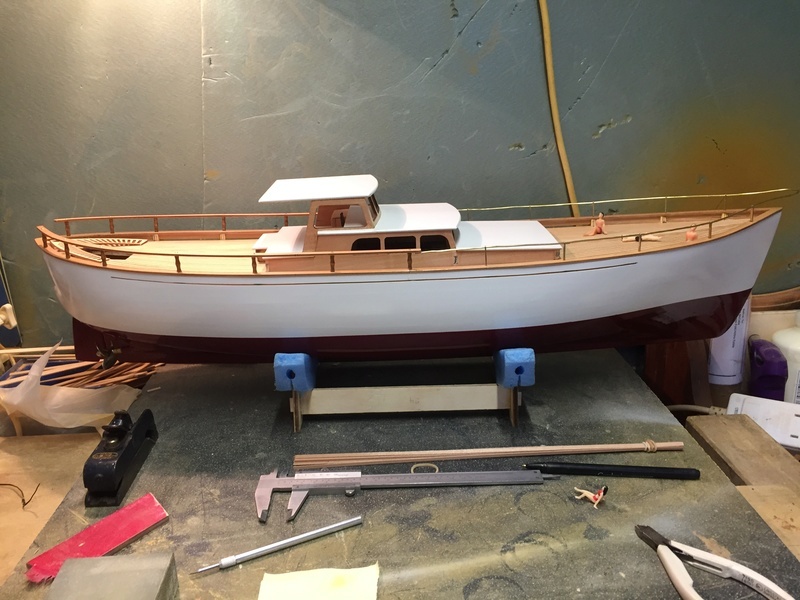 awful things......taught me nothing except to avoid early Billing boat kits with a passion. 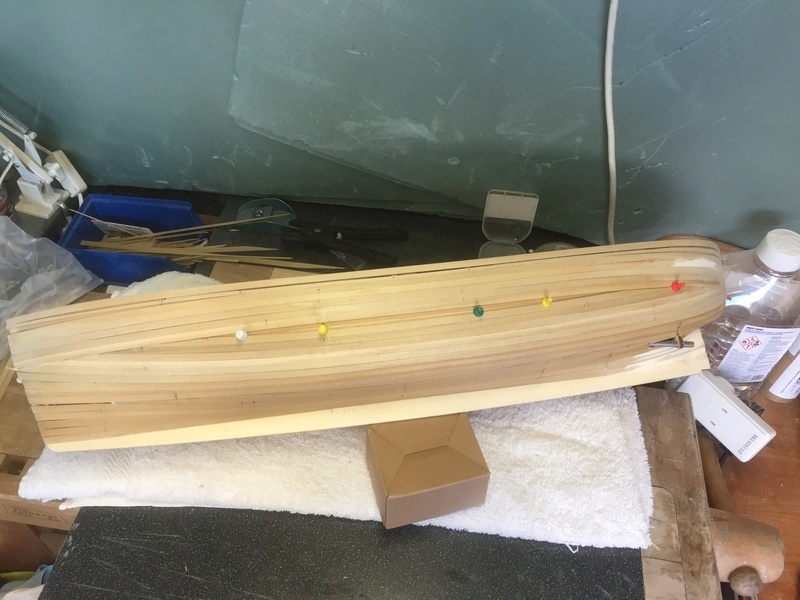 Sorry all I've got in news at the moment is that the second layer of planks are going down better than I thought they would. Just hoping I can tidy up around the prop shafts. If not good old filler will save the day. All the planks are down and filler is going on. After that I've decided to put a layer of fibreglass. 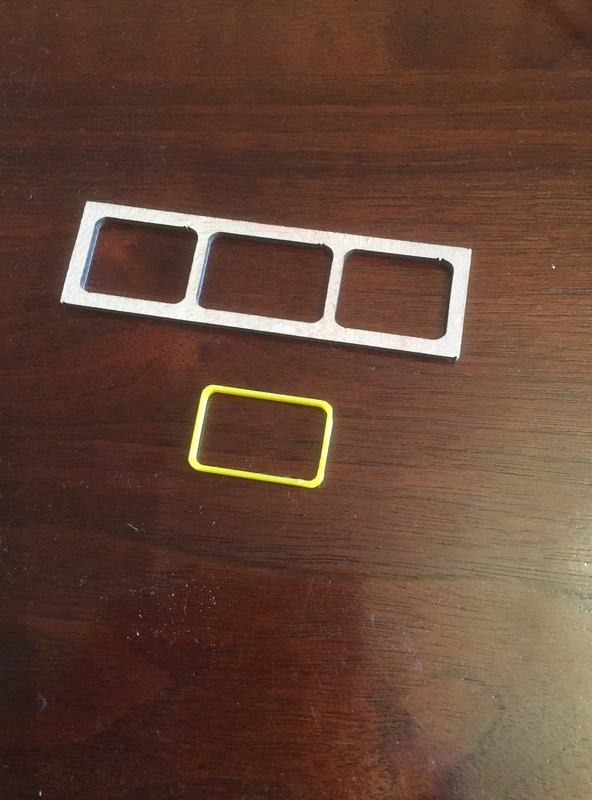 I Have been looking at the cabin and decided to make some window frames. Ive printed these out and will be glue clear 1mm Perspex on the back. Glued flush inside they should just stick out 1mm at the front. Not sure of the final colour yet white or black. She floats. Needs a bit more weight. The tikka cooking sauce is not staying. Managed to get a few more hours in and have fitted the hand rails. Then it's the cabin next. Abit of a tricky drilling job today. 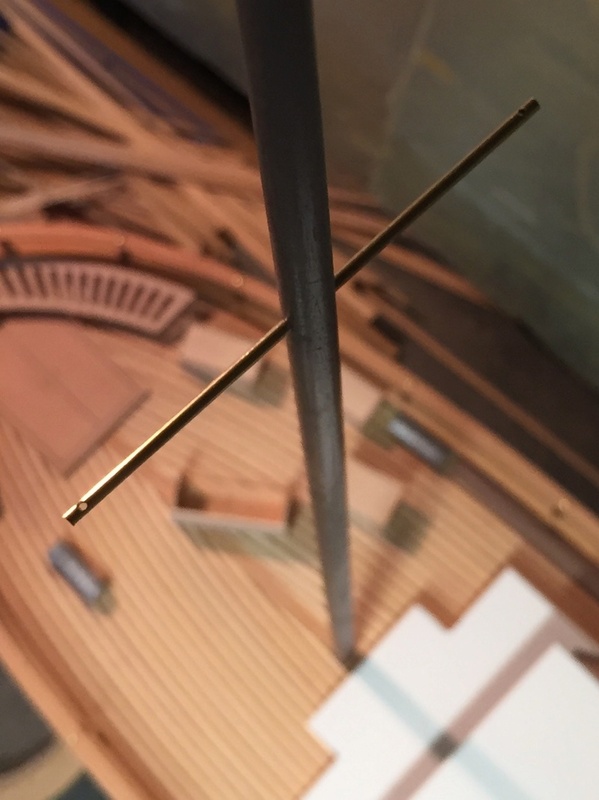 2mm holes in the mast and 1mm holes in the boom. 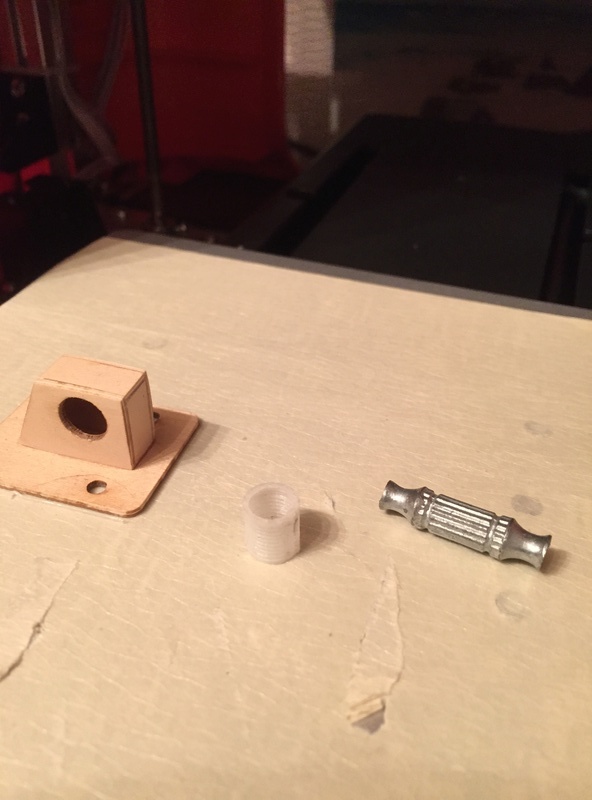 Made drilling jigs and managed to get 1 part done. 3 more to do. 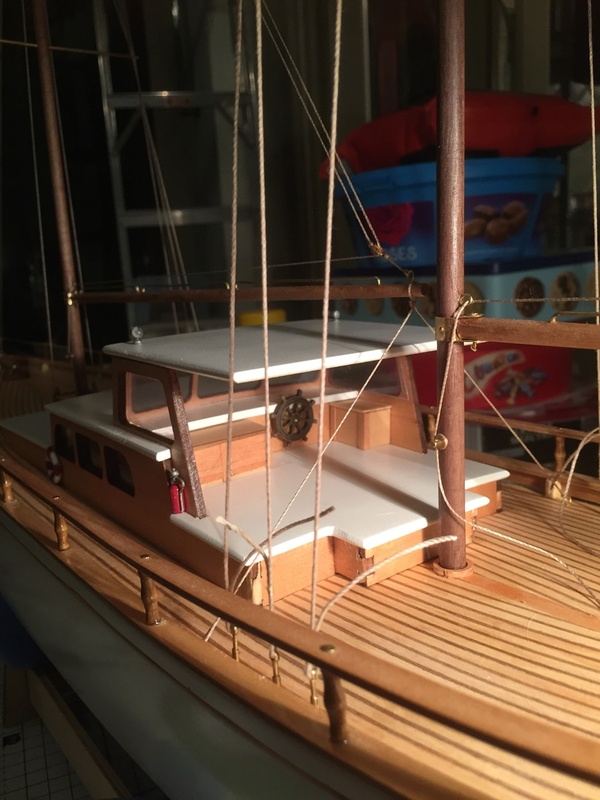 Nearly at the point where I can start the rigging but the varnish on the masts is not drying. Brought her inside to speed things up. The varnish took ages to dry but at last it’s gone off. 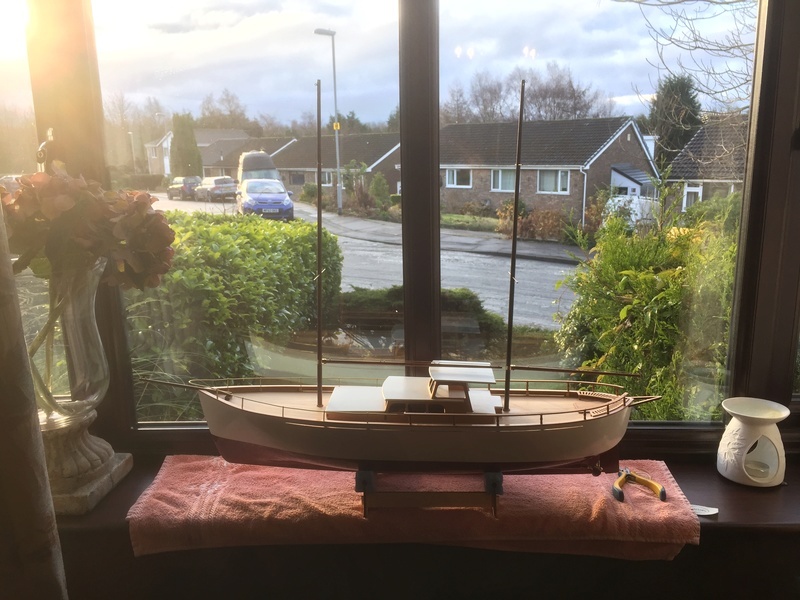 Managed to start the the rigging hopefully I’ll get this finished while I’m off for Christmas. 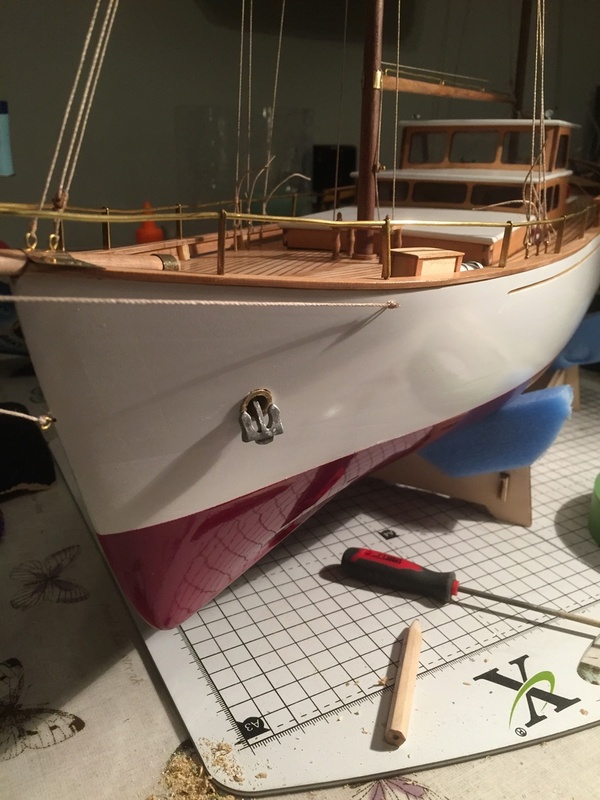 Rigging all finished. 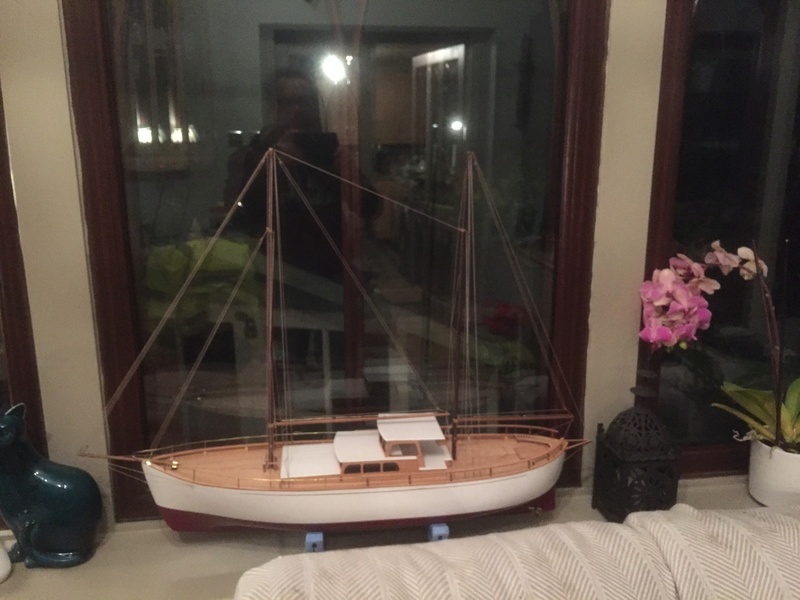 With this been my first boat with rigging do I need to wax it and when it gets wet will it tighten up or go loose, just a thought? 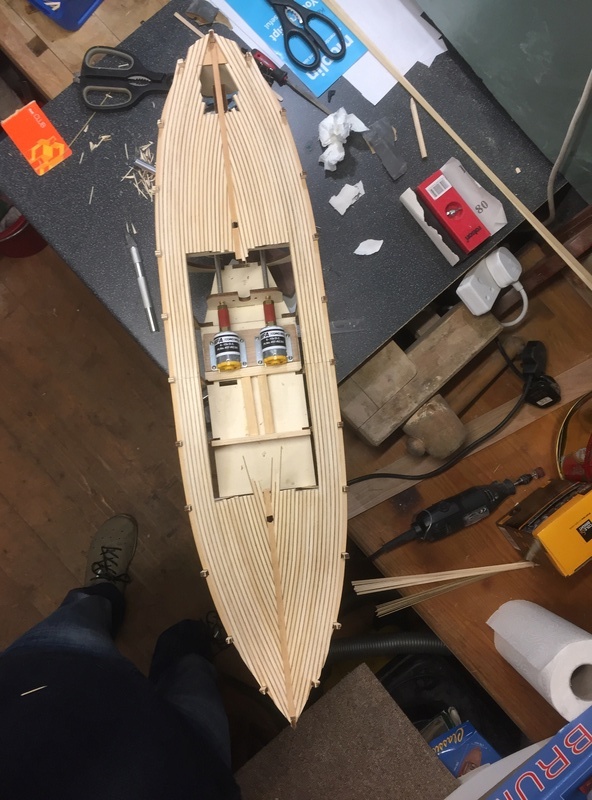 Just deck fittings to finish off. Not had time to do that much work on her for a bit but hopefully back on the job now for that final push. 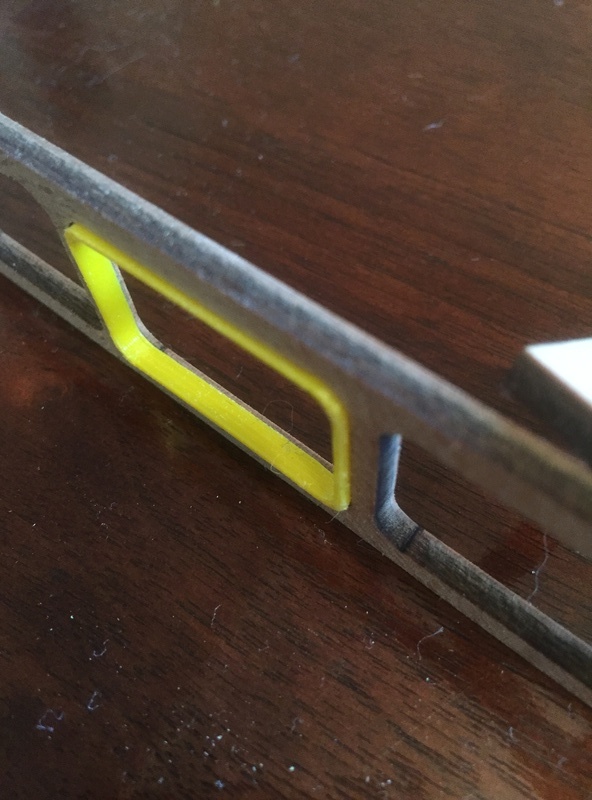 Today I’ve glued down some deck fittings. Also fitting the anchors. 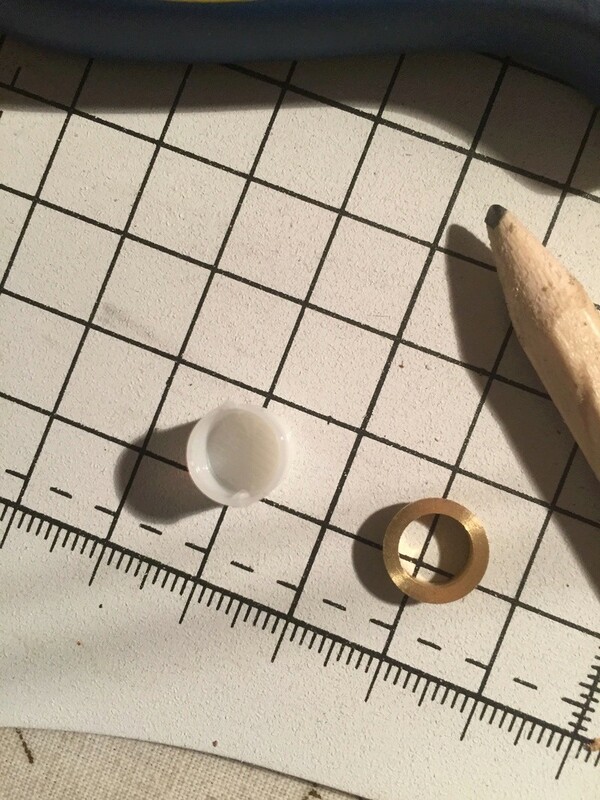 For this I had to 3D print a cup for the back of the brass howse holes. Managed to print a .5mm wall on the cup but it had a seam that ran down the inside that needed to be trimmed away. 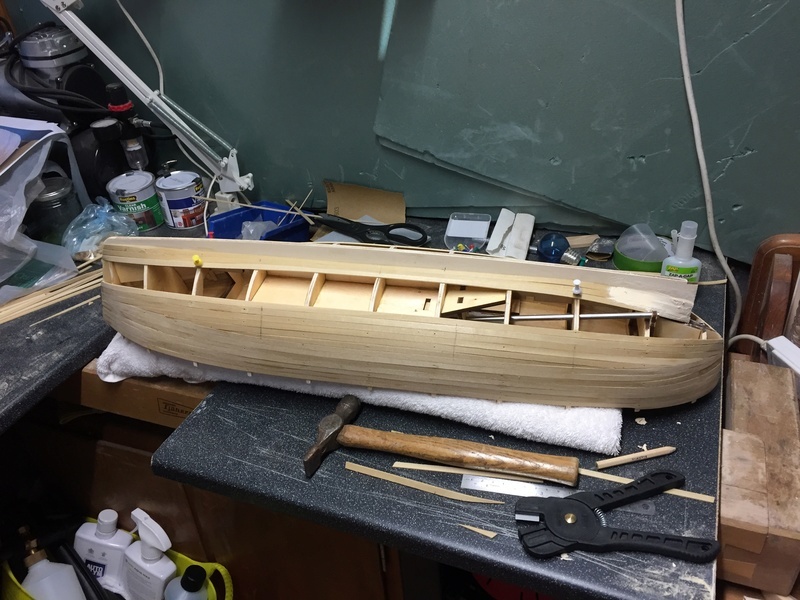 This was glued on the back of the brass ring and then glued in to the hull. Just felt so wrong drilling a hole in the hull. 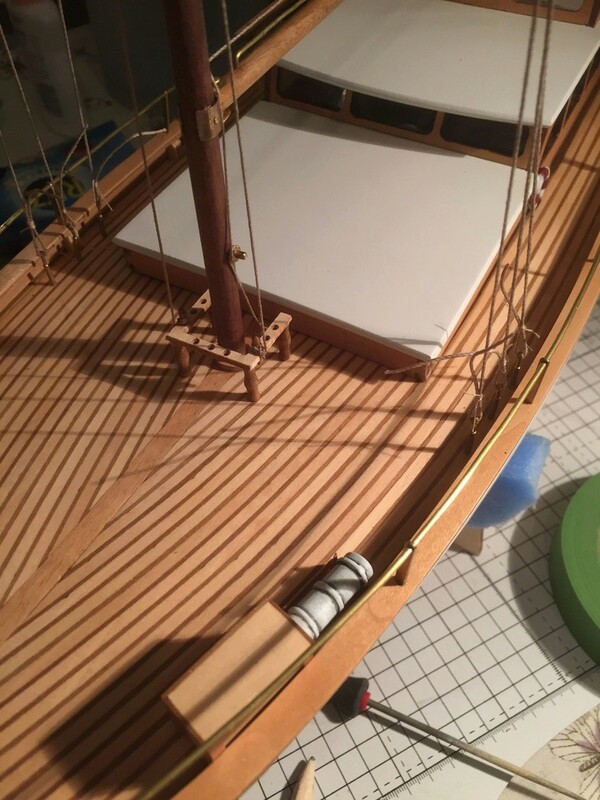 Then the anchor was glued in place. Just needs a bit of tidying up on the white paint around the hole but all in all happy. 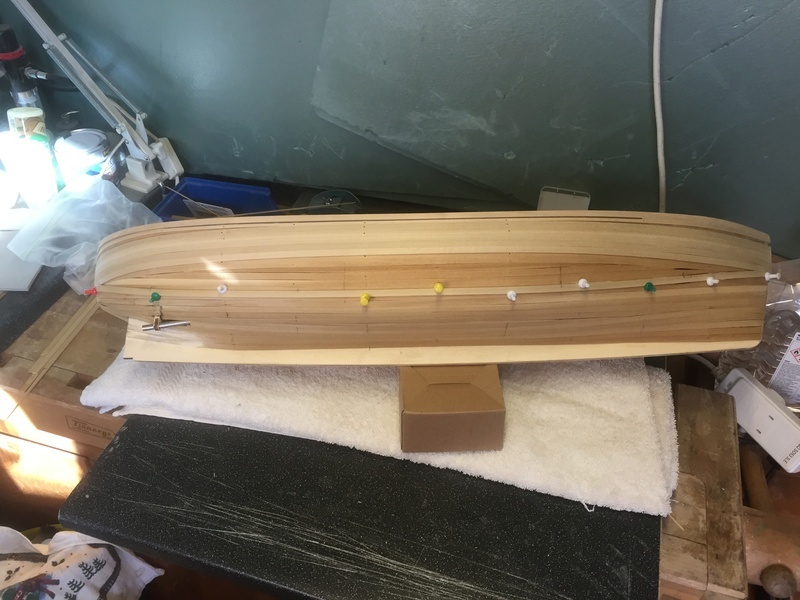 TheRcModelBoatForum.com :: The Slipway :: Build Blogs!